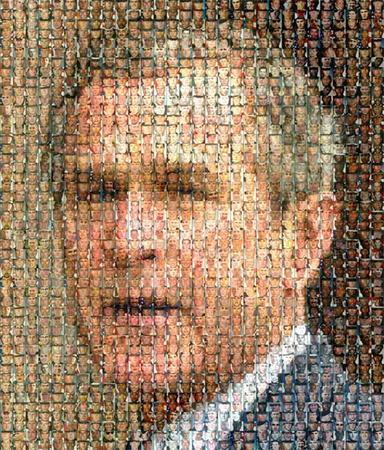 This is a photo mosaic of George W Bush, constructed of pictures of Americans who have died in Iraq since the same self-proclaimed "war president" entered office. I guess they didn't have time to include the 20 or so who died in the last 24 hours. 7 Apr 2004 @ 19:14 by sharie : So powerful! I hope the other Presidential candidates use the collage of photos for their campaign. Art has always found a way to surface in the face of crisis. This mosaic art is a good example. Thanks , I have recently been searching for info about this topic for a long time and yours is the best I have came upon so far. But, what concerning the bottom line? Are you positive in regards to the sohrue?|Wcat i don’t understood is actually how you’re not actually a lot more well-favored than you may be right now. You are so intelligent.